Perfect to celabrate a birthday. An hour packed full of riding and games. Tailored for beginner or novice riders. 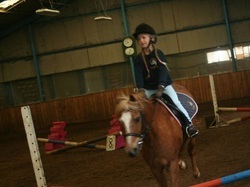 A Pony Party is avaiable on Sunday Afternoons 1 p.m. - 2 p.m. or 2p.m. - 3 p.m. This is for a minimum of 6 or maximum of 10 riders. Please call us on 01903 992061 to discuss arrangements for a special event. 50% deposit required with booking. Full payment due 2 weeks before the date of the party.